Health officials urge consumers to throw away contaminated eggs or return them to the retailer. Wright County Egg conducted a nationwide voluntary recall of shell eggs on August 13, 2010. The eggs were packaged under 13 different brand names and distributed nationwide, and on August 20, 2010 the recall was expanded. According to a press release on the U.S. Food and Drug Administration (FDA) website, eggs affected by the latest recall as of August 20, 2010, are distributed under the following brand names: Hillandale Farms, Sunny Farms, and Sunny Meadow in 6-egg cartons, dozen-egg cartons, 18-egg cartons, 30-egg package, and 5-dozen cases. Loose eggs are packaged under the following brand names: Wholesome Farms and West Creek in 15 and 30-dozen tray packs. The loose eggs may also be repackaged by customers. The recall affecting eggs shipped since May 16, 2010 were sent to food wholesalers, distribution centers and foodservice companies in California, Illinois, Missouri, Colorado, Nebraska, Minnesota, Wisconsin, Arizona, Texas, Georgia, Washington, Oregon, Nevada, Utah, Arkansas, Oklahoma and Iowa. 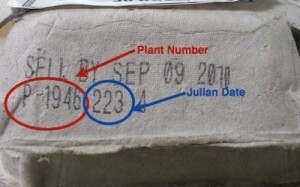 The FDA displays an organized list of recalled eggs with its Brand, Plant Number and Julian dates listed. The plant number begins with the letter P, followed by the Julian date. In this photo, the Julian date comes before the plant number. Please note: There are cartons (as seen in the photo at left) where the Julian number is first, followed by the plant number. What do Consumers Need to Do to Stay Safe? Don’t eat recalled eggs. Consumers who have recalled eggs should discard them or return them to their retailer for a refund. Individuals who think they might have become ill from eating recalled eggs should consult their health care providers. If consumers are unsure about the source of their eggs, they are urged not to eat them and to discard them immediately. While it’s recommended by health officials to throw out or return contaminated eggs to the retailer, the Centers for Disease Control and Prevention (CDC) offers smart and sage advice for information to reduce your risk of a Salmonella Enteritidis infection. Keep eggs refrigerated at ? 45° F (?7° C) at all times. Wash hands, cooking utensils, and food preparation surfaces with soap and water after contact with raw eggs. Eggs should be cooked until both the white and the yolk are firm and eaten promptly after cooking. Do not keep eggs warm or at room temperature for more than 2 hours. Avoid restaurant dishes made with raw or undercooked, unpasteurized eggs. Restaurants should use pasteurized eggs in any recipe (such as Hollandaise sauce or Caesar salad dressing) that calls for raw eggs. Consumption of raw or undercooked eggs should be avoided, especially by young children, elderly persons, and persons with weakened immune systems or debilitating illness. It’s important to remember that eggs, like meat, poultry, milk, and other foods, are safe when handled properly. Proper hand washing is important before preparing food and after handling uncooked meat, poultry and eggs. Shell eggs are safest when stored in the refrigerator, individually and thoroughly cooked, and promptly consumed. If your eggs are recalled they are not safe. 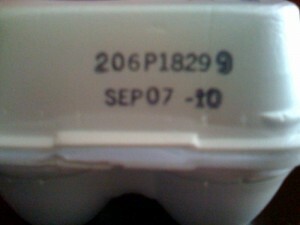 Check the brand of eggs, the plant number and Julian date. If your eggs are recalled, throw them out or return them to the retailer.